Vocal Intensifier is designed to be easy to use. 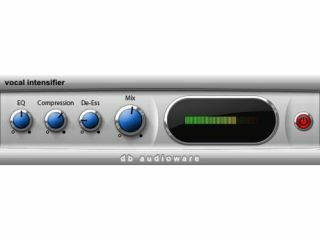 Vocal Intensifier is the first of db Audioware's new 'Studio Specialist' plug-ins. Designed to add punch and presence to your vocal tracks, it sports a simple user interface that shouldn't befuddle even novice audio engineers. The plug-in is based on a technique known as parallel compression. This is often used on drums but, in this case, it's specifically tuned for vocals and promises to add loudness and presence without having a negative impact on dynamics. The interface features just four knobs - EQ, Compression, De-Ess and Mix - so with a little experimentation, the idea is that just about anyone should be able to get useable results. Available in VST and Audio Units formats and on Mac and PC, Vocal Intensifier costs $79/€59/£39. You can find out more and download a demo version on the db Audioware website.